Christmas is in full swing here at my house-blogging assignments have me scrambling to decorate and photograph our Christmas decor so please forgive my fast-forward over Thanksgiving!! I had been holding back on decorating the outside of my house but a few of my neighbors put up lights over the last week so I thought I was safe to hang this easy DIY ornament wreath on the front door this week! 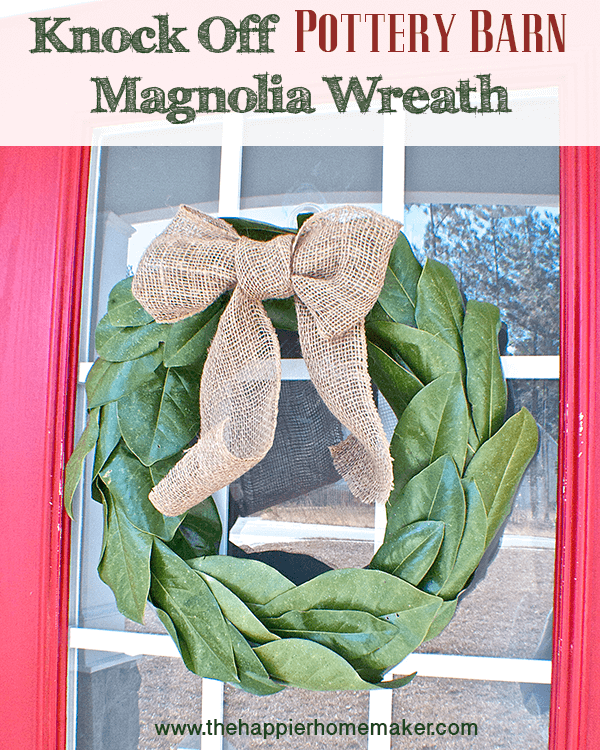 This wreath is super easy to make-it took me 30 minutes and cost less than twenty dollars! Update 2018: I made a video tutorial to help show how to make the wreath as well as an update on the number of ornaments and total cost! 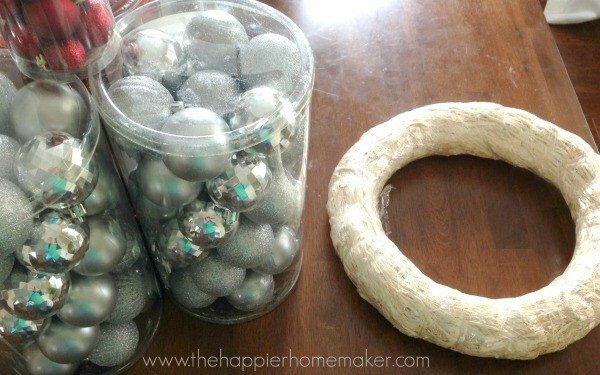 The pictures of the gold DIY Christmas ornament wreath are from 2018, the red and silver DIY ornament wreath is from the original blog post in 2013. For my wreath I wanted it to be predominantly silver with touches of red so I used about twice as many silver ornaments as red. 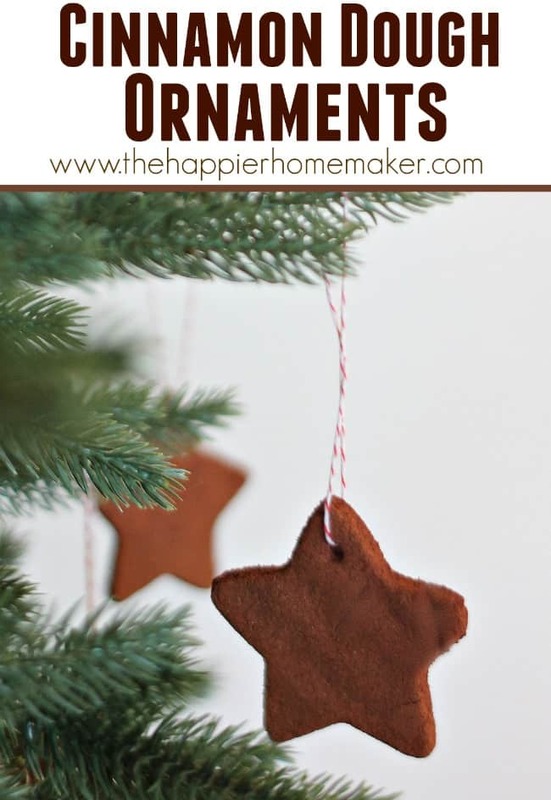 Be sure to use shatterproof ornaments and use a variety of ornaments for interest-glittered, matte, shiny! 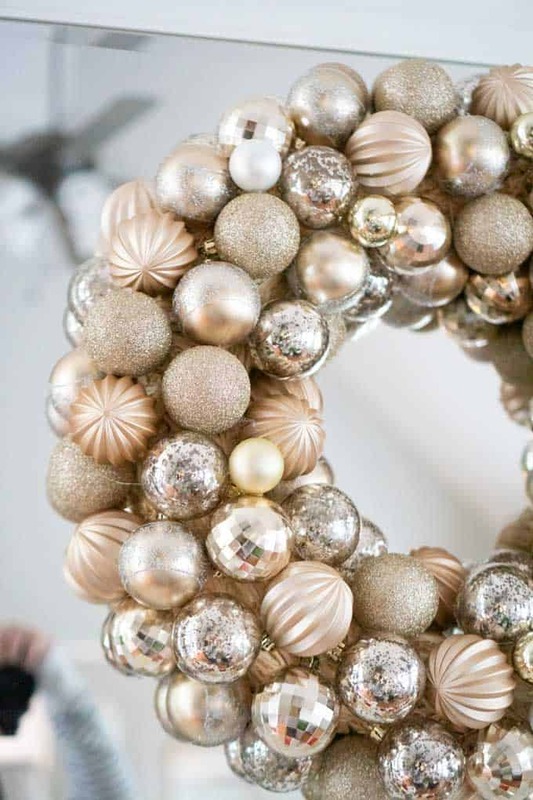 Begin by hot gluing the large ornaments to the wreath form along the inside and outside edges of the wreath. Then slowly layer the ornaments until the wreath is covered. 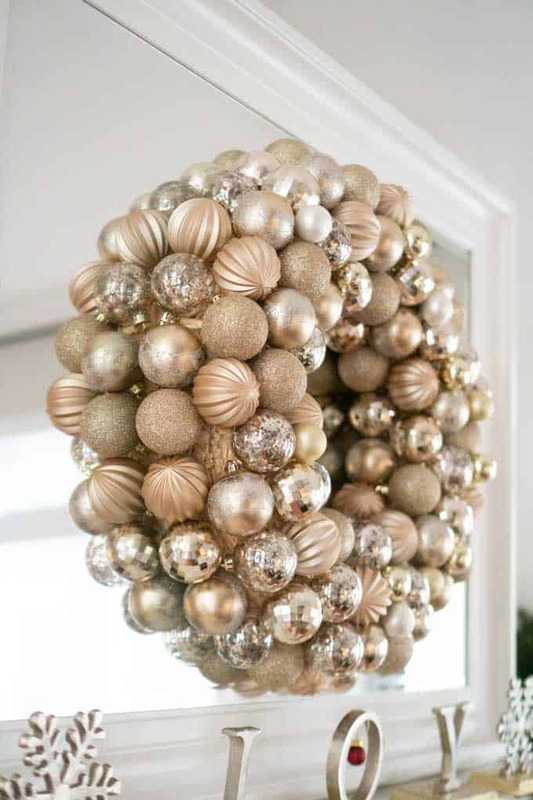 Once you have no more room for large ornaments fill in any gaps with the smaller ornaments. I promise this is just as easy-peasy as it sounds. I’ve tried the method of stringing ornaments on a wire coat hanger and this turned out significantly better and was faster too! I’m so excited by how it looks with our red door and can’t wait to show you the rest of the porch decor I have planned! Great idea. I tried the wire hanger one as well, but to me, it does not look as nice as this one. Can’t wait to make this, this weekend. You should definitely have more instruction. Like saying start along the outside and inside and work from there. Because now mine looks like crap. Hi! 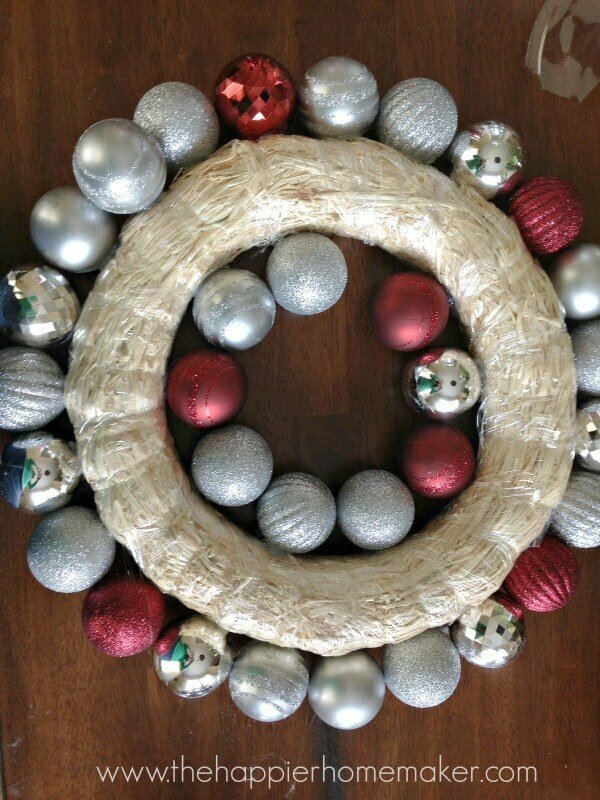 I was wondering if you take the plastic off the wreath before hot gluing? It looks like its still on there….and if so, doesn’t the hot glue not stick to the plastic? Sorry for so many ? 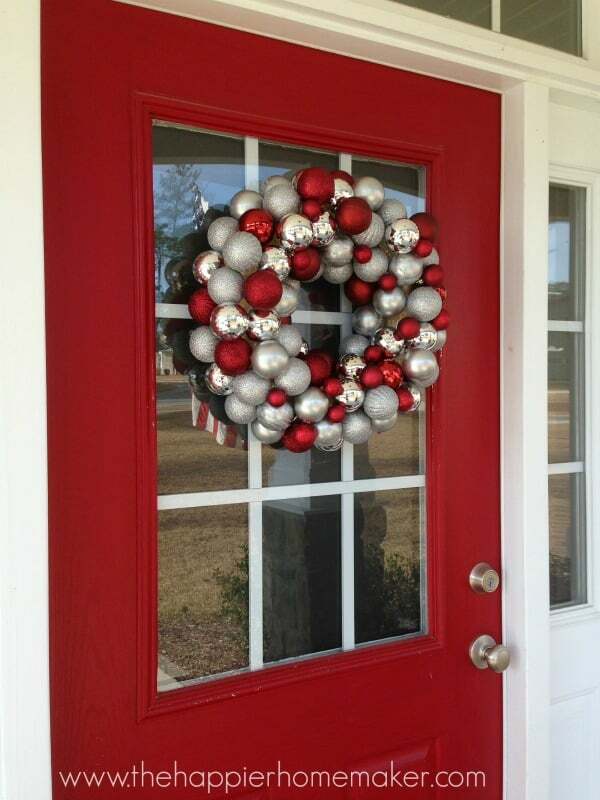 ?….I made a gorgeous one years ago and the command strip fell last year and broke the wreath. I came across your idea for using straw. Got it today at Micheals (it seems like it would be messy if I take the plastic off?!) Thanks!!! 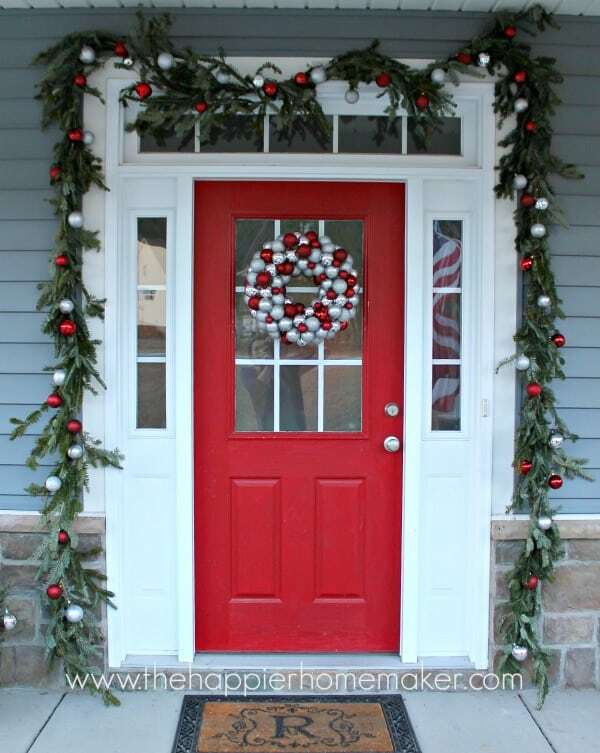 I love the wreath but what I want to know is how you make the garland around the door. It’s so pretty as well. I have lots of trimming left from my tree and love spreading it throughout my house why not do the out side too. Thanks. Thank you!!! Wish I could send pictures !!! How do you view the tutorial video? So, where do people buy ornaments for wreaths? I have looked all over. I want purple, green and gold for Mardi Gras.